The adage says "We put dollars in the bank NOT percentages." 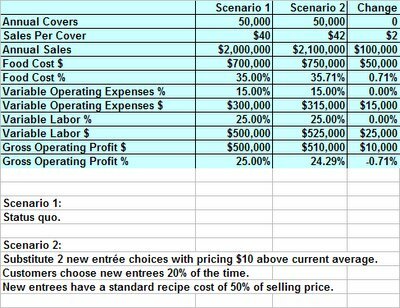 So, should you run some higher priced entrees with a corresponding higher food cost percentage to boost profits? Maybe. You should be prepared for some unplanned possibilities. I'm going to use an example steak house with current annual covers of 50,000 and sales of $2,000,000. The average sales per cover is $40. Management has decided to introduce two new entrees priced $10 above the current average entree price. These entrees are costlier and will raise the food cost percentage. Let's say 20% of patrons choose the new entrees and covers remain stable. Sales increase $100,000 and food costs go up $50,000. We should have another $50,000 going in the bank account. It's a good thing...right? Maybe. All too often, managers forget to follow through with the dollars vs. percentages concept in the other cost components. If they track labor cost and other operating expenses on a percentage basis, a big chunk of the $50,000 could leave the bank even though operating reports look solid (percentage viewpoint). These cost components are fairly difficult to manage on an entree basis. Few companies track utilities on a per cover basis. If we had variable labor costs of 25% and other operating expenses of 15%, you could see $40,000 (40% of $100,000) in higher labor and operating expenses creep into the income statement over time. We'd still be $10,000 ahead of the status quo. If the raw ingredients used to prepare the pricier entrees are more volatile in price, you could actually see months with zero change in the bottom line despite a nice sales jump. How often do you read articles about publicly traded restaurant companies with higher check averages and average unit volumes with little to show on the bottom line? Management explains the disappointing profits are due to higher prices for key entree items. It happens all the time. I'm all for more dollars in the bank. Don't ignore percentages when implementing these strategies. You've raised a very good point...and provided an interesting anlysis. Wouldn't the percentage of variable operating expense and even variable labor diminish in scenario #2, since cover counts are constant? Or, am I missing the point altogether? Thank you for expressing a great opinion. Your point is quite valid. I used "maybe" for my answer because great managers get this done every week. However, when management puts the menu on auto-pilot and ignores the game plan, my scenario is frequently the result. It takes time for the sales of the new entrees to work into the financials. 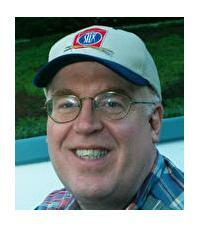 If labor and overhead are tracked strictly by %, overhead $ can increase with no new covers. The operating expenses percentage and labor percentage should both decline as a result of the extra revenue. Like Joe's "maybe", my "should" belongs in quotations to because whether or not that "should" becomes reality depends on the management systems within the operation. The situation in which that extra revenue does not equal extra profit points to bad management policy to me, and tells me that managers are controlling labor and other expenses based on a budgeted percentage cost, instead of being taught to more closely analyze labor on a case by cases, day by day, shift by shift, hour by hour basis. This is why it can be dangerous to bonus management simply by meeting budget percentage goals. 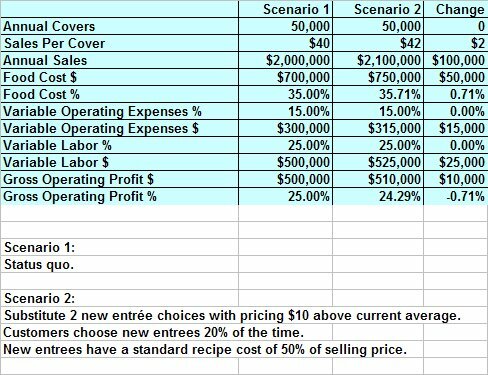 While I do believe percentages should be used as a measuring stick, restaurants need to have a bonus plan to reward management for over-achieving against budgeted dollar amounts, not based on percentages but on profitability alone. Afterall, profitability is the only common goal that owners can have with every employee, but those employees are bonused on profitability for that to happen. When employees are bonused only on parts of the financial picture, like food cost for the kitchen, and sales for front of house staff, the goals for each department can conflict with each other and cause adversity between departments. Sorry to get off on a tangent, but it's all related. Bad management practices create situation like Joe is talking about, where a good thing (extra gross profit) can turn into a negative (lost profits). Long story short, don't give your managers simple percentage goals to meet. Teach them what it takes to achieve profit and reward them for making you more profitable. You are spot on: "When employees are bonused only on parts of the financial picture, like food cost for the kitchen, and sales for front of house staff, the goals for each department can conflict with each other and cause adversity between departments." At Sodexho, bonuses were paid once overall profit goal was achieved (i.e. budget profit justifies management's salary). Specific targets took a back seat to overall profits.